Flash is used by majority of websites to display interactive content. Popular websites like Facebook, MySpace, Flickr, Youtube use Flash to display specific parts of the content. Lot of advertisements, interactive landing pages use Flash for the dynamic display and thus history of website loading Flash content is stored on your computer. By default, Flash history cache files are not deleted when internet browsing history is cleared through web browser settings. 1. Click here to open Settings Manager webpage in browser. You should see ‘Website Storage Settings’ tab highlighted, otherwise you can click second last tab (as indicated in screenshot below). 2. 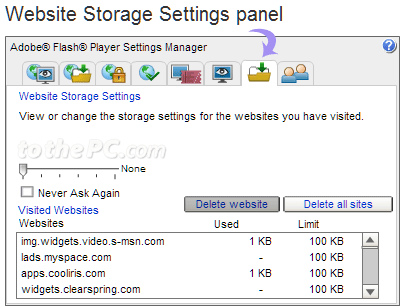 In the lower part of Website Storage Settings window you should see flash cache files of websites visited by you previously. 3. You can select specific website cache file listing and click ‘Delete Website’ button. Then click ‘Confirm’ button to remove specific flash cache file. 4. To remove all Flash cache files from your computer, click ‘Delete all Sites’. This will free your computer from all Flash history files of websites opened previously. Flash cache history will start storing fresh files as you open new websites. You can repeat the above procedure to delete Flash cache files anytime. Alternatively, you can also use Flash Cookier Cleaner program to delete Flash cookies saved by browsing on the computer. How to delete hidden browsing internet history?